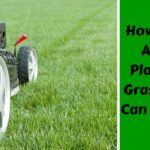 After spending a few seasons landscaping and building garden beds, I found myself finally settling into the mindset to add in the small details that often go overlooked during the building, planting, and hauling of dirt that occurs during a new garden process. Garden border details and lighting solutions were fairly simple to incorporate once the yard began to take shape, but it’s always felt like something was missing. 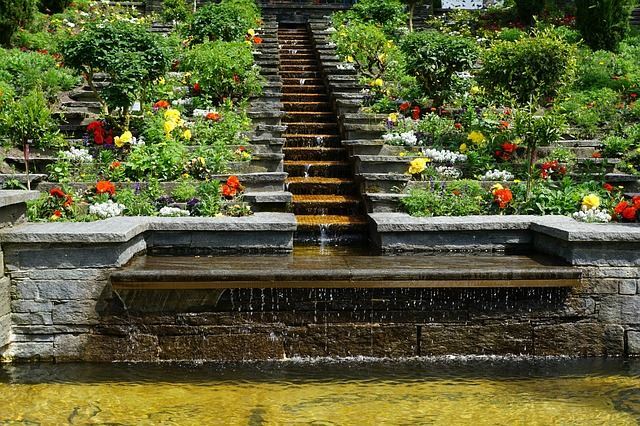 In my search for something to bring more life to my garden, I quickly found that water feature ideas were definitely a topic to further research. 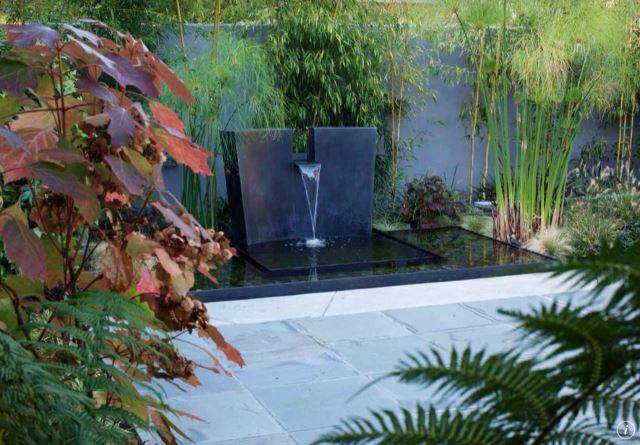 Water features bring a touch of tranquility to your gardens, and also is a beneficial addition to your surroundings. 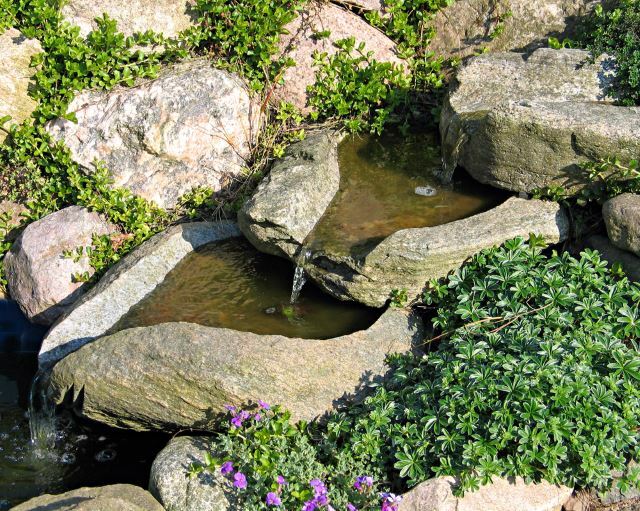 Not only is the trickle of water a peaceful and relaxing sound, water provides a draw for birds and other beneficial critters to your gardens. 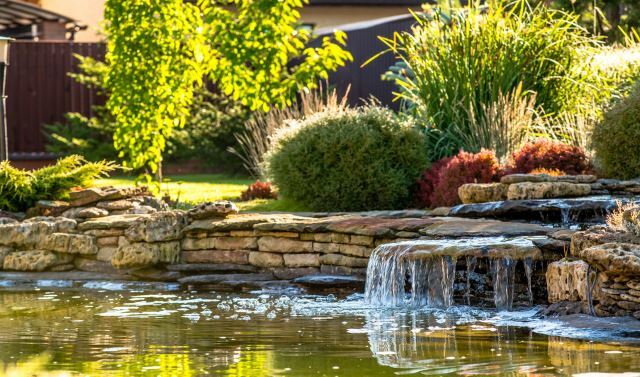 Whether a water feature is planned in advance as a prominent feature to your landscaping, or is a simple add-on to your existing yard, you will be glad to have taken the time to include it. Space constraints are only an issue if you make them so. 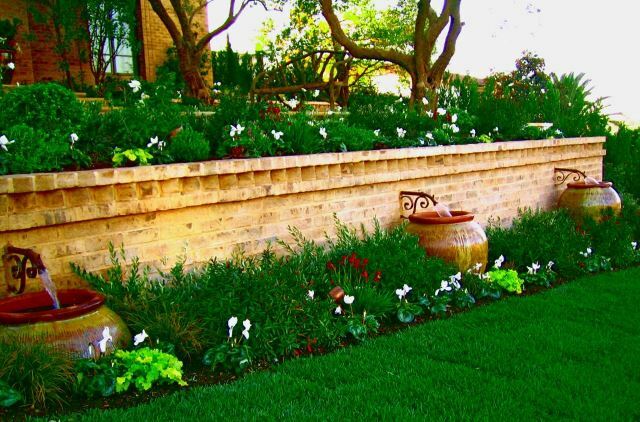 Even if you aren’t sure if you have the room for the larger water feature you may want, consider getting creative and tying it into something you have already planned to install- such as this retaining wall that serves as a meandering garden river. 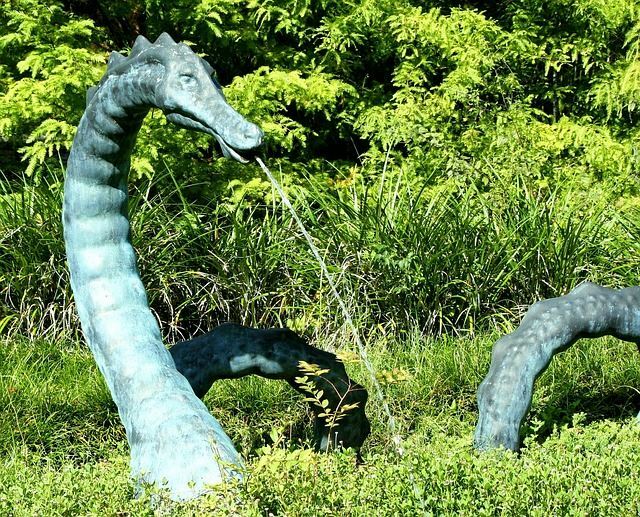 No matter the shape of your waterscape, fountains help draw wildlife , and create both aesthetically and audibly pleasing details to your surroundings. These simple water fountains provide graceful falls without an overwhelming sound. 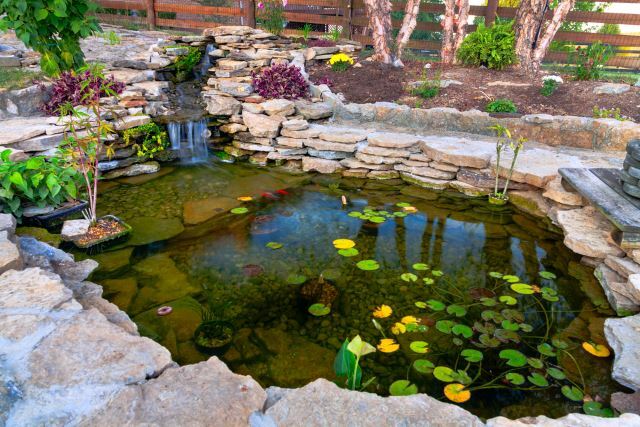 Ponds don’t have to be oval or circular in shape. 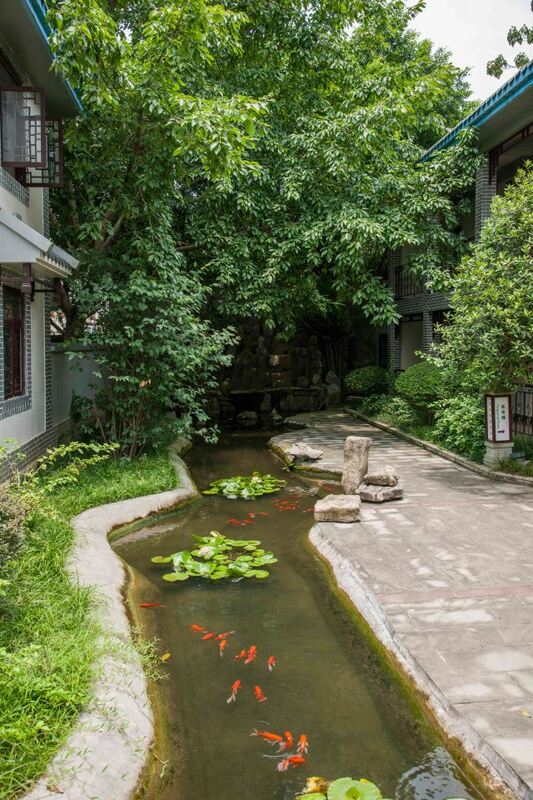 These long moat like ponds provide an unique border to your landscape design and also provide a peaceful flow during your evening garden walks. The addition of fish to any pond is also an enjoyment to watch. 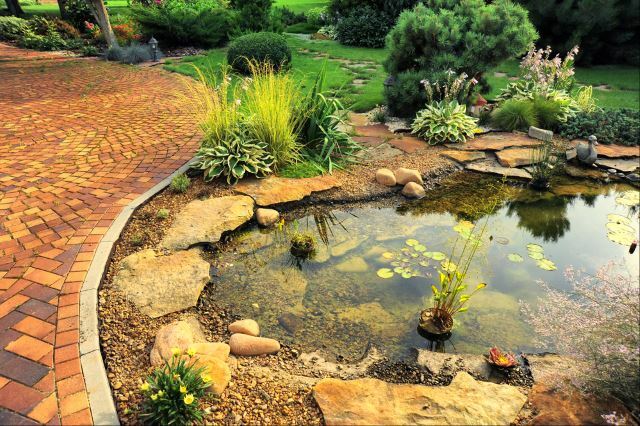 When planned in advance, large ponds can become a living, moving part of your gardenscape. Larger bodies of water can include more features as well as a large variety of plants. 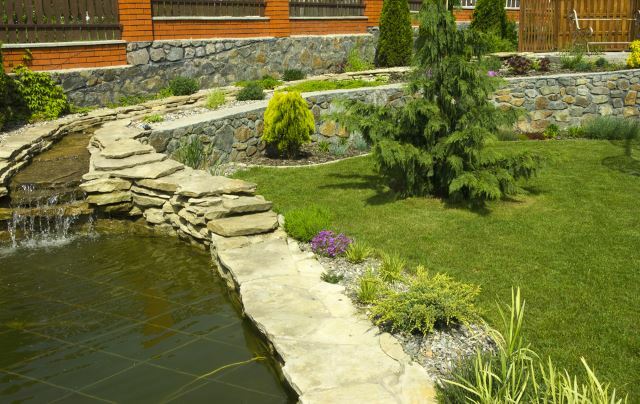 Creating pond, waterfall, and stream like features hep provide depth to any sized yard for added interest. Ponds are surprisingly simple to add to an existing landscape, especially with the help of preformed pond liners. 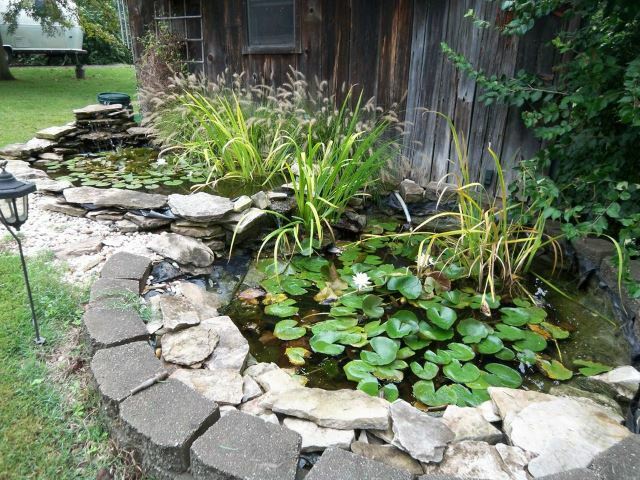 A good sized pond can easily become a weekend project with a little bit of planning. All it takes is a little muscle to move some dirt, pond liners, a water fountain kit, and some decorative rock to create a look such as this. 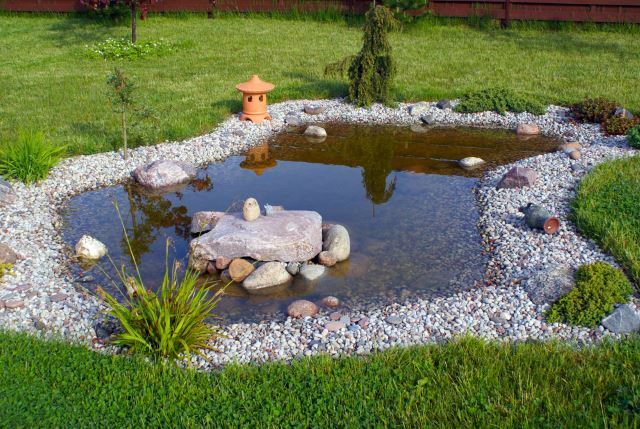 Spruce up a large grassy area with the addition of a sitting pond. SImple, classical pond designs are easy to incorporate almost anywhere, and the addition of a faux dock, such as the one pictured here, provides you with an area to relax upon and enjoy your surroundings. 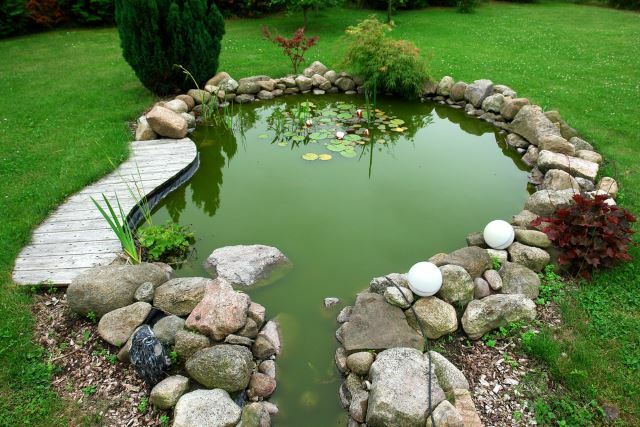 Large ponds, or even existing retention ponds can be spruced up with a landscaping overhaul. Turn your muddy banks into an enjoyable overlook that can be enjoyed year round. Not only does the addition of rocks to a bank provide stability to the soil, it also helps with erosion and keeps the water from becoming silty. 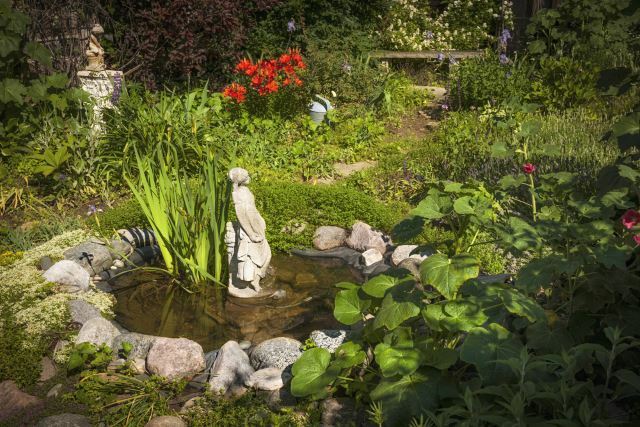 A shallow pond can provide the garden bed detail you’ve been searching for. 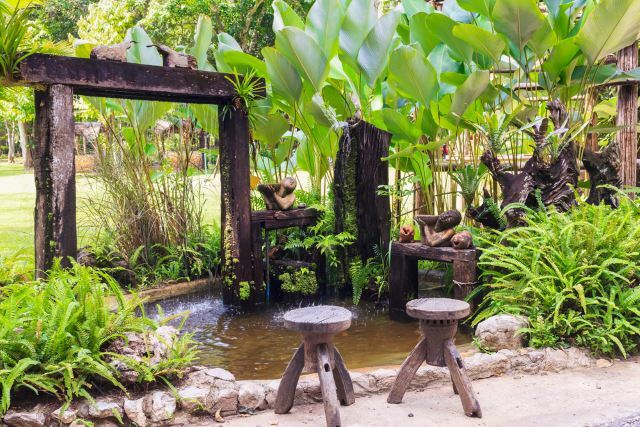 Step outside your comfort zone and include a simple water feature that is able to support the many water plants that need to keep wet roots. 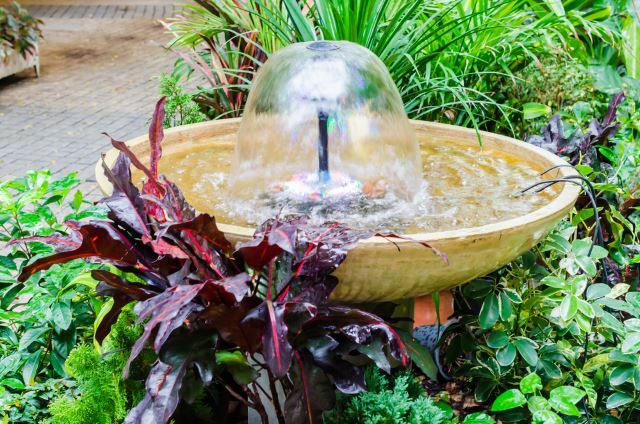 If you are lucky enough to have a natural water feature, think outside the box in how you incorporate it into your landscape design. Why build a bridge when you can meander a custom made path across instead? When we think waterfall, we often think of rocky outcrops and fountain like features. 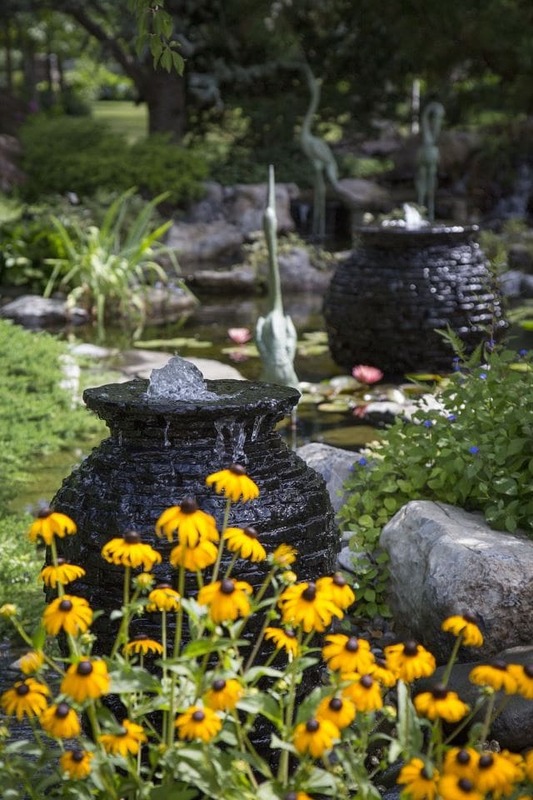 Why not create the unexpected from statuary or more unexpected materials- such as oversized pots? This clay pot provides the perfect container for a unique, one of a kind design. Water features can provide the perfect property border. When combined with living, vegetative ‘fences’ and open structures, you also provide the illusion of an extensive horizon- which makes your property look bigger than it already is. 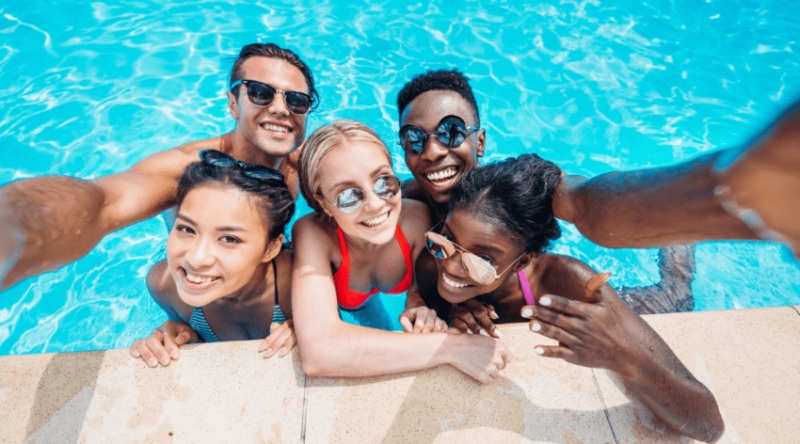 Your outdoor living spaces truly are an extension of your home decor and you should tie it into the nearby feature you include in your landscaping. This contemporary deck meanders gracefully into the surrounding yard, and includes the pond as part of the overall design. 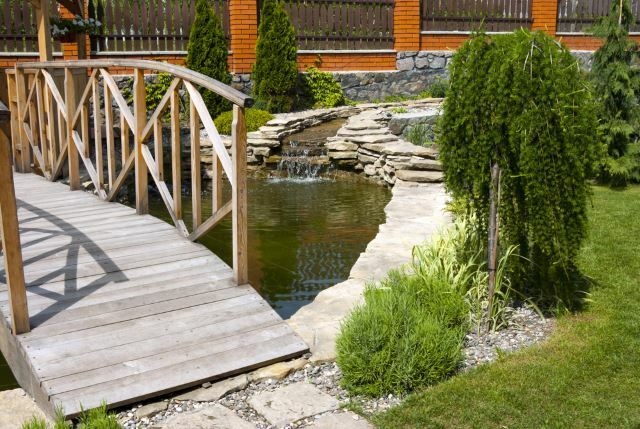 There is no river requirement in order to incorporate a bridge into your landscape design. 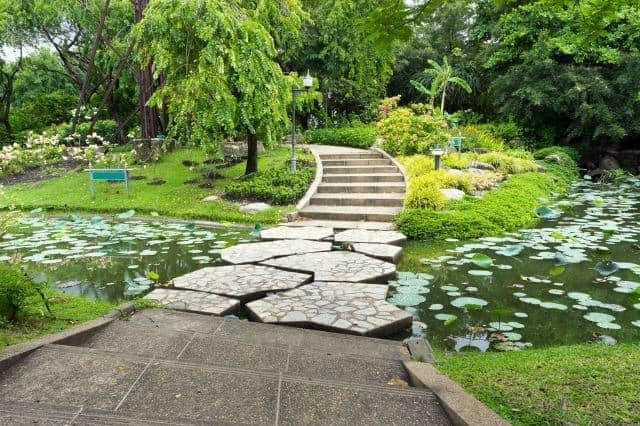 This simple pond provides enough of a hint of a meandering river and gives the perfect foreground to show off and reflect the scrolling detail of this ornate walkway. 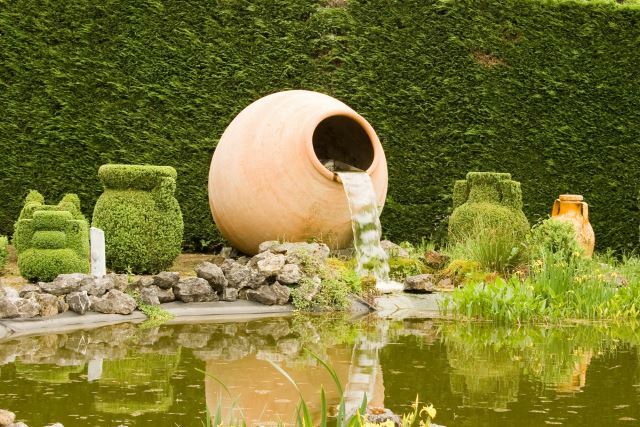 Even the smallest of yards can benefit from a water feature. These carefully carved rocks provide the perfect trickle that you can place in just about any space. 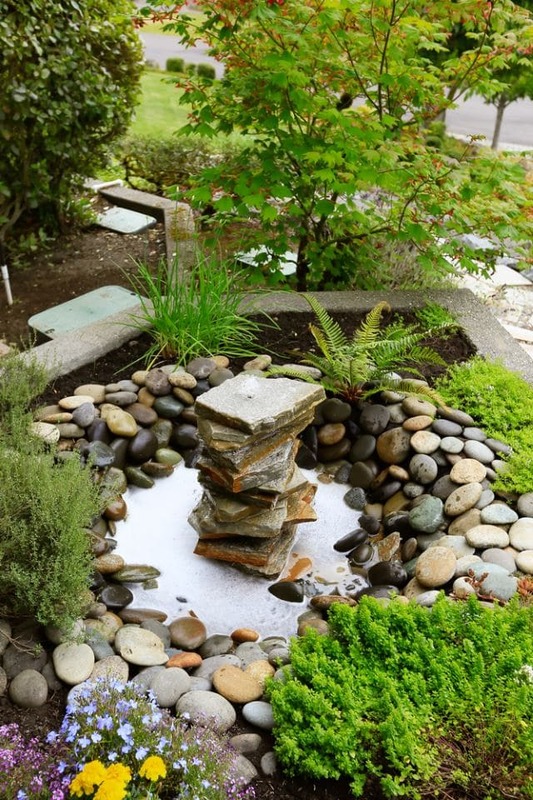 A quick look around your yard will yield the many places you can tuck in a simple flow of water. Early spring in the forests often include hundreds of temporary vernal ponds that provide peaceful reflection under the leafy canopies. 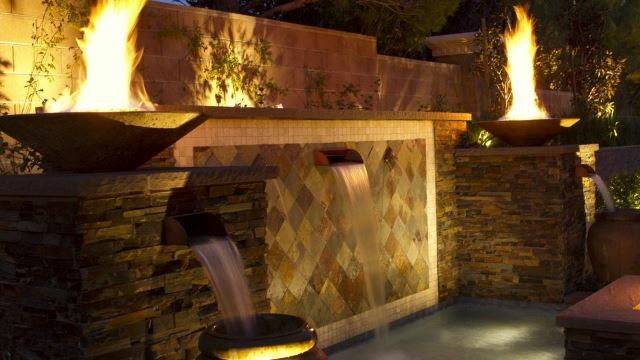 You can mimic this effect year round with the inclusion of small ponds and waterfalls throughout your property. The use of forest carpeting, such as ferns and other native plants magnifies the effect. This little pond looks like it’s just popped out of the ground for your enjoyment. Plastic liner, pea gravel, a simple filter, and any other little details you want to add are all it takes to have your own tranquil reflecting pool. 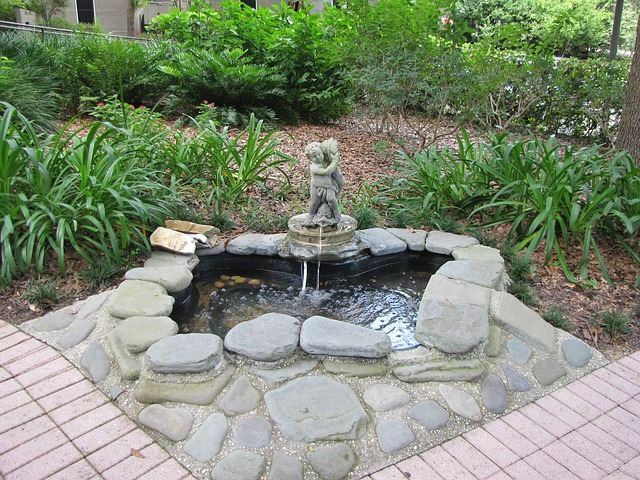 A small water feature displays as a pedestal for a prominent statue to show off more than one garden detail. 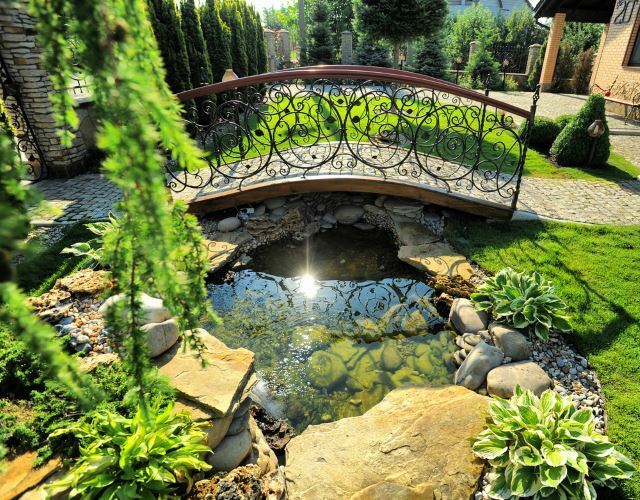 Tiny ponds such as this add interest to your yard and are often a surprising, and enjoyable part of your design. 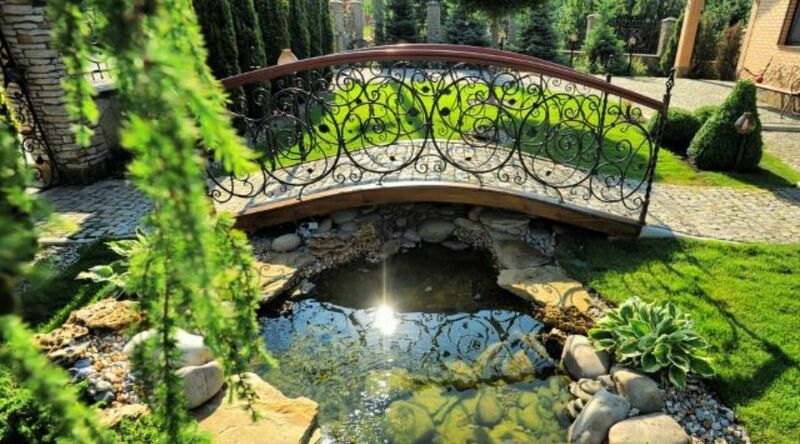 Take advantage of your natural land features and instead of trying to level out difficult terrain, incorporate it into a landscape design that provides a unique, and creative perspective. This tiered hillside provides not only a path amongst the flowers, but an innovative way to get water to the gardens framing it. 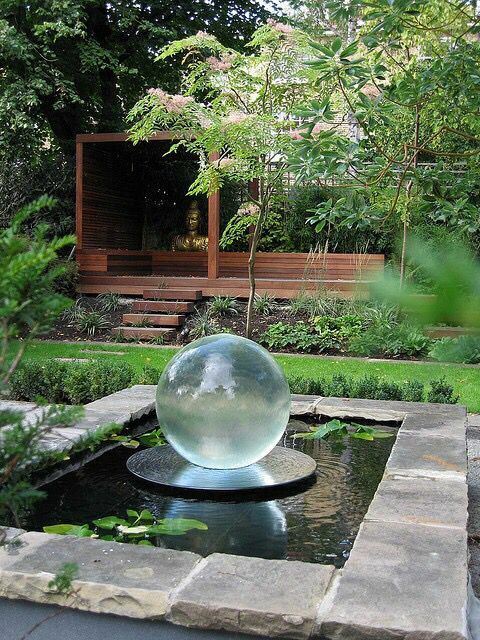 Water globes are popular additions to gardens everywhere. Not only do they not take up a lot of room, they bring a unique look to any landscape. Larger globes are perfect for added height to large garden beds, whereas smaller choices can be fun and unexpected additions tucked away amongst your flower choices. 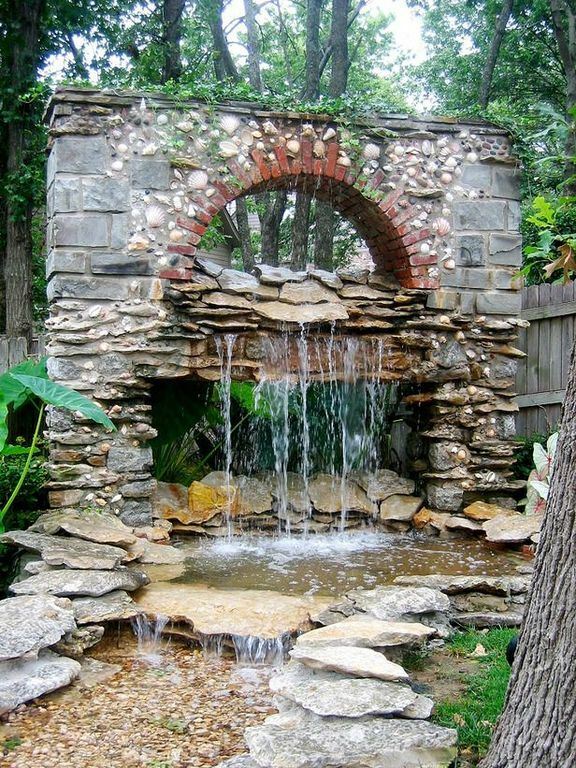 Stacked rocks are a unique way to present a water feature either with a pond, or as a disappearing waterfall. This popular way to add both height and interest can be easily created with landscaping rock either by drilling holes for fountain tubing, or with careful tubing placement within amongst the rocks. Simple and inexpensive birdbaths can be transformed into a small, fun little fountain to add a trickle of water to your backyard ambiance. These types of fountain kits are very available and can be used in a variety of ways. 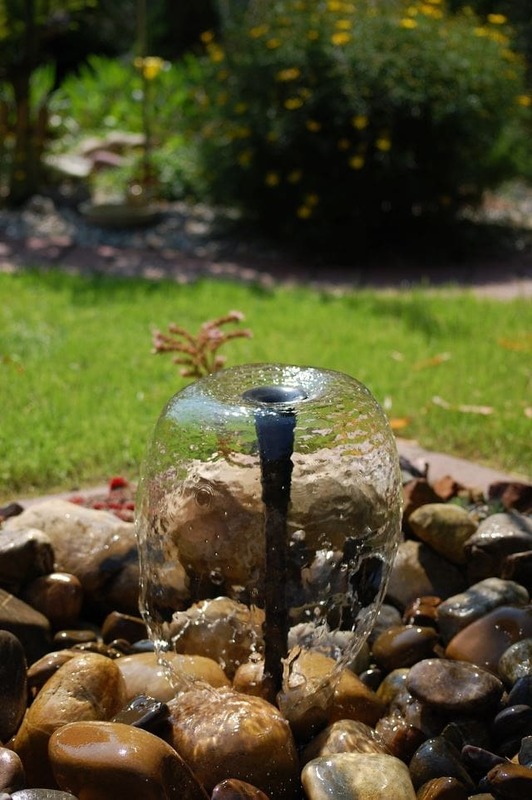 Garden fountains and fountain kits are an easy way to add in water interest. Falling rock fountains similar to this are generally readily available for you to use as a stand alone feature, or as a simple way to include with larger ponds or meandering rivers. Who said you have to only choose one? 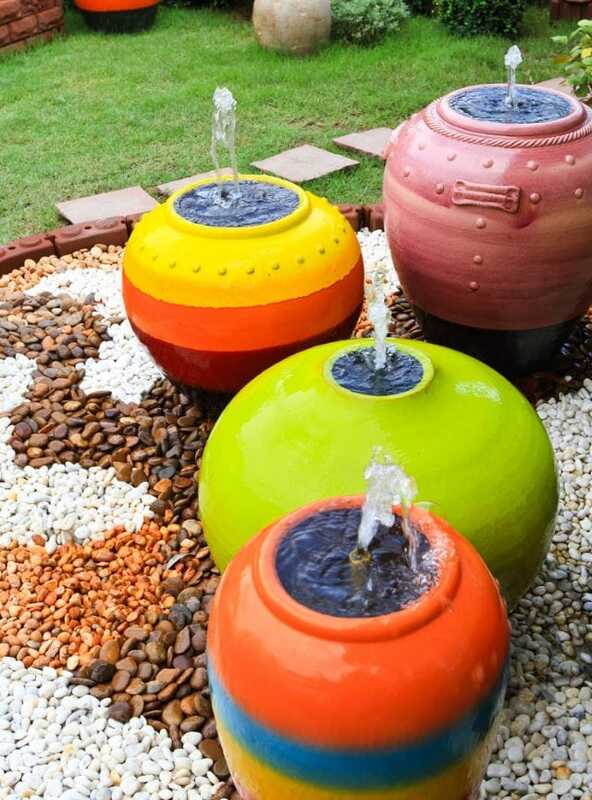 Pot bubblers and pondscape combinations make for a unique way to present a variety of differing water choices. Placing the two together allows for a landscape design that provides flow and interest to your yard. Make your water feature a main event by creating a standalone centerpiece. 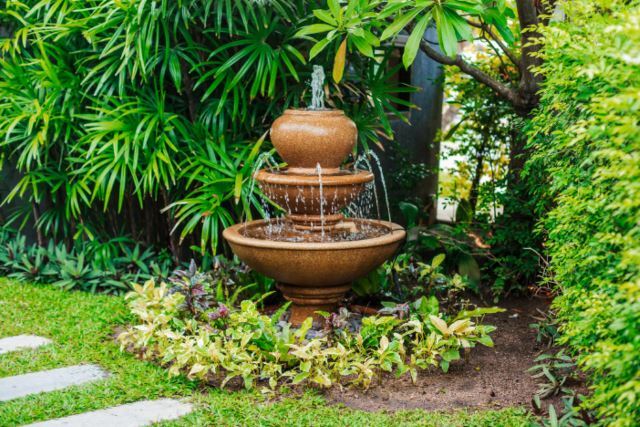 This above ground fountain provides a tranquil equation to the patio, and allows for the use of larger shrubs and trees to help blend it into the surrounding landscape. 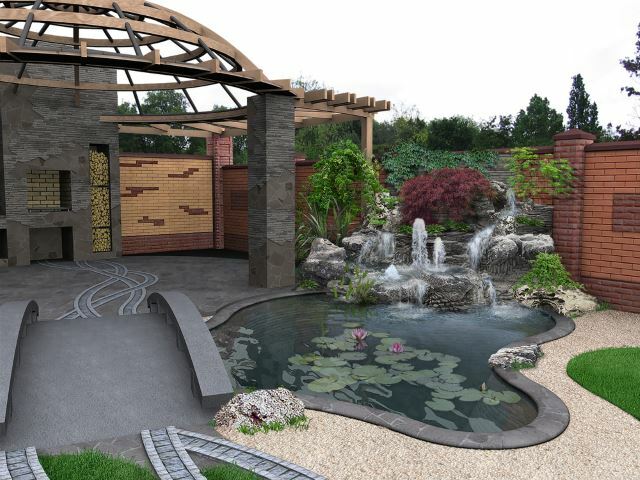 Design your ponds and fountains with personal use in mind. 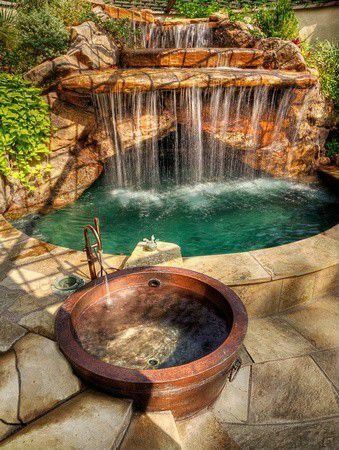 This waterfall is actually a hot tub and uses a smaller, rustic waterpot feature as an easy access to maintenance and care. This arched wall looks like it was a conveniently placed ruin from another age and brings a touch of the past to this forested garden. Water is easy to pipe up any feature you can dream of, and your limit is only hindered by your imagination. Wiers, the wide spigot that is featured in these waterwalls are the perfect choice to provide a long, continuous flow of water from any sort of flat, horizontal surface. They can be recessed into a wall to make it look as if stone is seeping water, or allowed to sit naturally to provide a ledge from which the water drops. 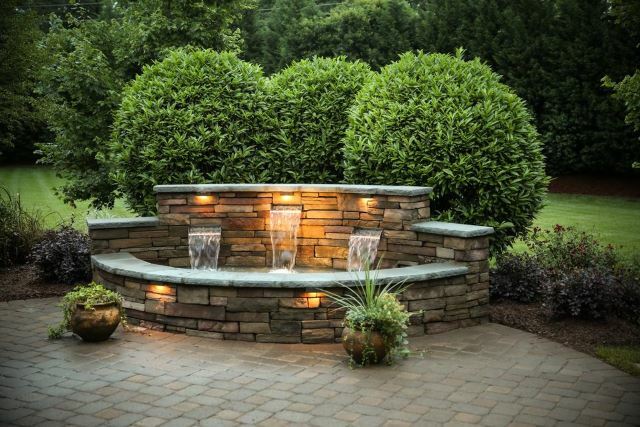 Mix and match the elements to light up the night with firepits that reflect off the water that dominates this wall and pond fountain combination. 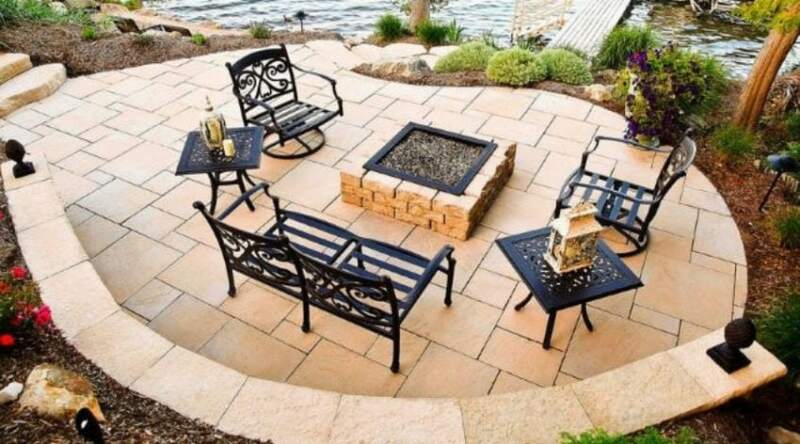 Firepits are a great addition to any outdoor patio water feature and provide a great contrast in any yard. 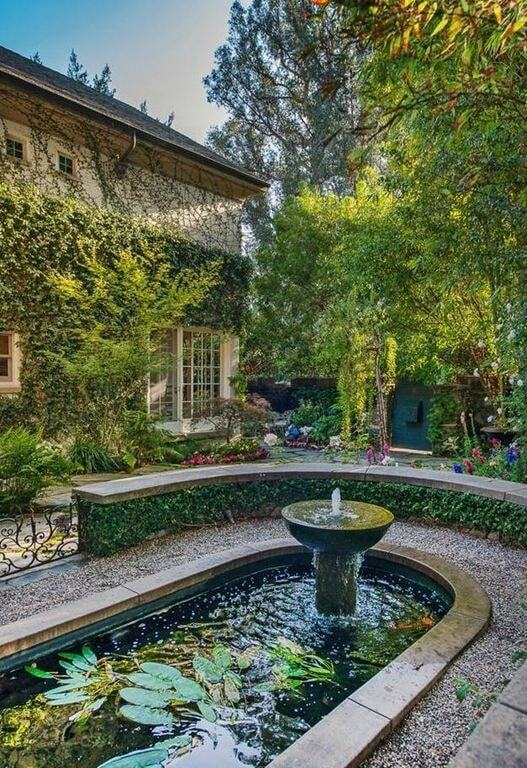 Nothing is quite as charming on a country estate as the addition of a fishpond. This pond is framed by both pavers and a low retaining wall made of both stone and wrought iron to mimic the architecture and ivies found in the surrounding landscape. A rock pond makes its home as part of a stucco patio and is finished to look as if it was built into the wall of the building. 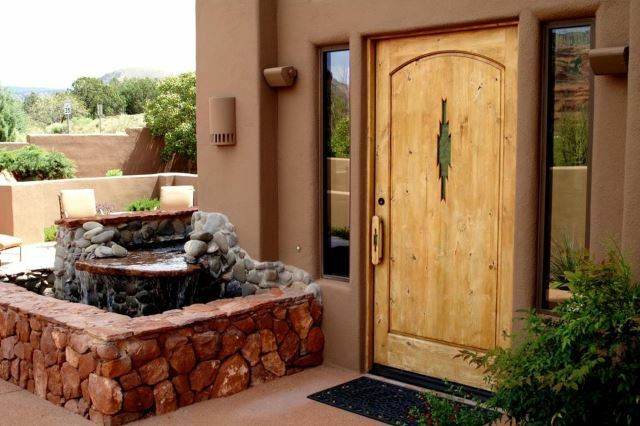 SImple water features and the use of contrasting materials and colors provides interest to otherwise simple decor. Add the trickle of fresh water and greenery to your urban cityscapes with rooftop ponds and flowering waterplants. Tapping into existing plumbing and taking advantage of the space walls provided can result in original features to enjoy year round. Modern gardenscapes can benefit from clean lines and angles that compliment the simplicity of carefully grown and manicured plants. This Asian inspired patio is surrounded by more traditional colors and lines found in minimalist landscaping. 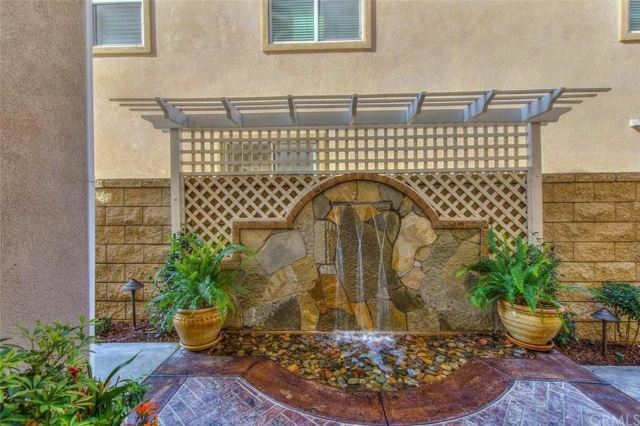 This fun waterfall helps provide privacy to the front porch and a backdrop to colorfully textured landscaping choices. Landscaping rock can be used in almost anyway imaginable and water pump kits help make your visions become a reality. 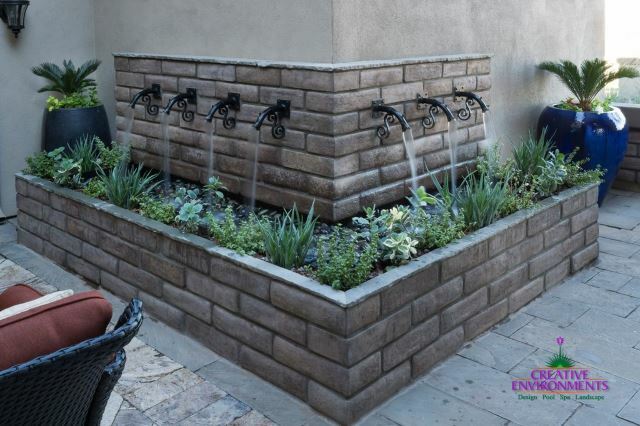 This entirely unique design incorporates walled spigots and a unique use of planting pots to create a one of a kind look. 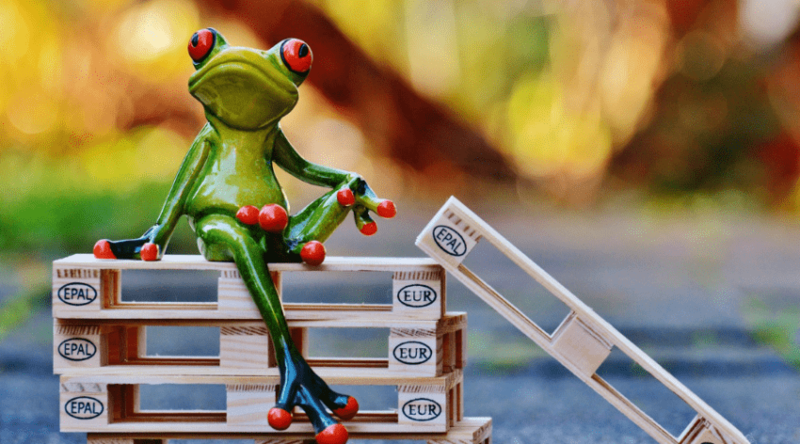 Sometimes a walk through a garden center can give you an idea of what resources are available and get your creative juices flowing. 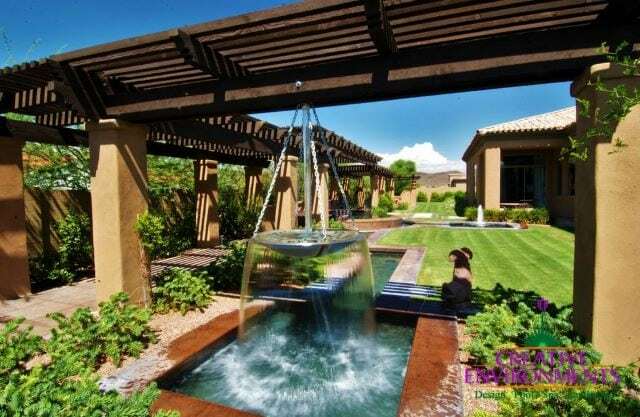 Let your water fall, literally, from a hanging fountain. If you have strong overhead beams, take advantage of them and create designs whilly unique to your yard. This recessed weir allows for water to run down this wall feature to disappear into a below ground cistern. These types of designs are perfect those areas that you want a stand out, larger waterscape, but without the standing water option. River rock allows a place for water to drain through, and also a substrate to plant water loving plants if you so desire. Why make one large pond when you can have two? 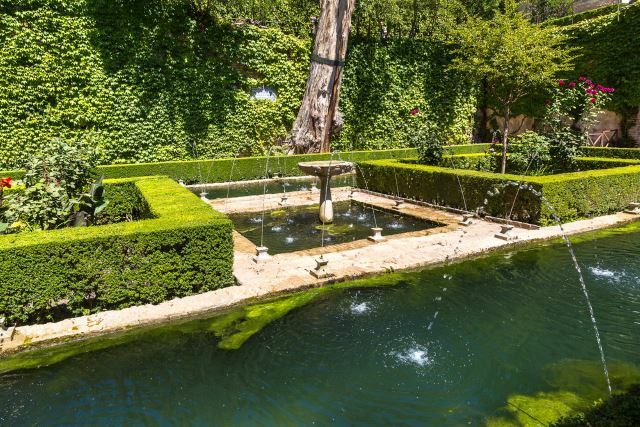 These twinned ponds provide shaping and interest to a quiet, shady corner of a country yard. 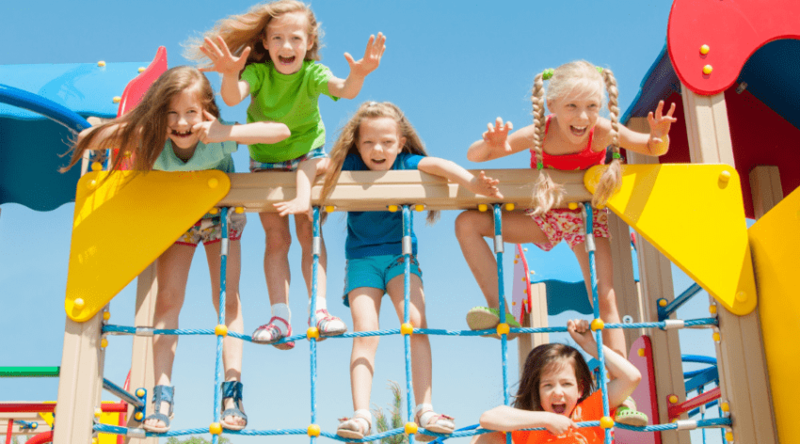 With proper planning they can share the same water source and pump system to keep your maintenance simple. A classical tribute to the Greek god of the sea, Poseidon features prominently in this garden walkway. Large sculpted fountains such as these provide everything you need to install a larger, above ground swimming pool and fountain display. 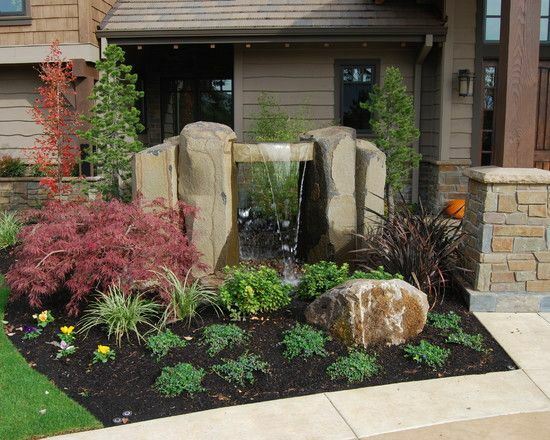 Concrete provides a stable base to landscaping rocks for a simple, yet classic fountain and pond combination. Its placement also helps round out the corners of the walkway and allows your eye to travel more naturally over the landscaping. Be sure to consider waterscape placement before putting in any permanent structures. 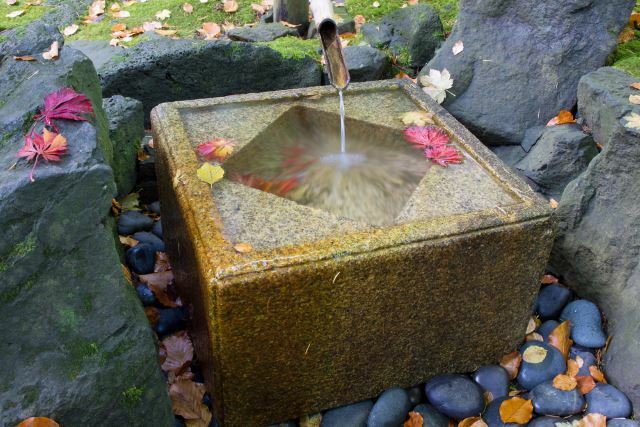 Bamboo fountains are versatile and easy to install with anything you choose to use with them. 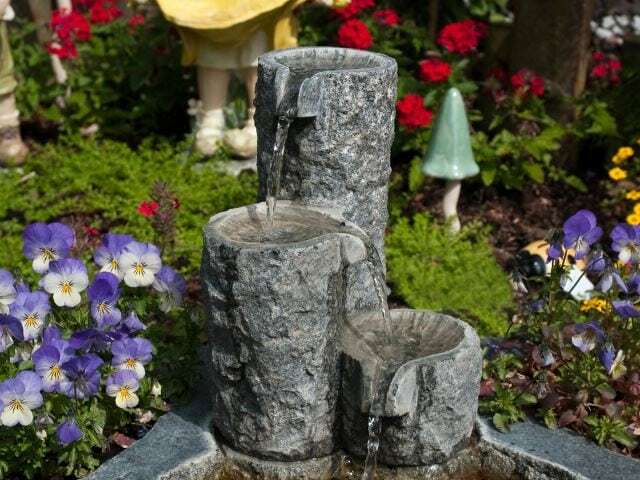 This carved block fits well into the rock garden within which it is paced, but barrels, pots, and other water holding containers can be used to create your perfect bamboo fountain. 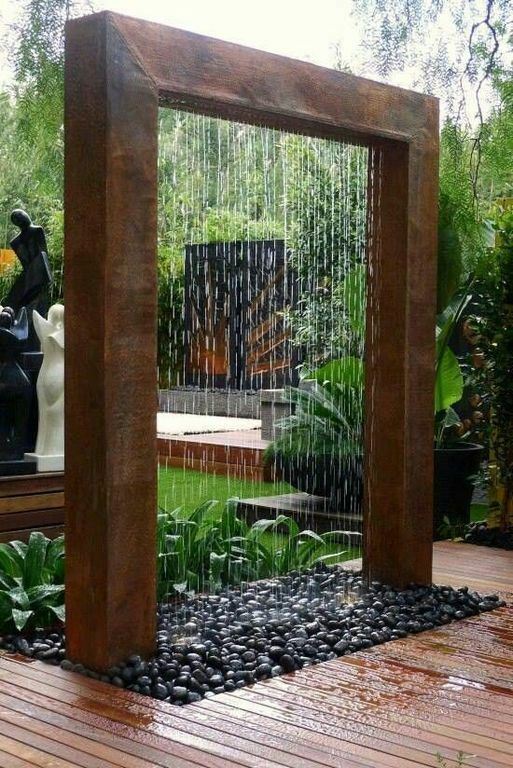 Create your own rainfall with a doorway into another realm. These neat waterwall designs can be placed almost anywhere to look as if you have created your own weather. 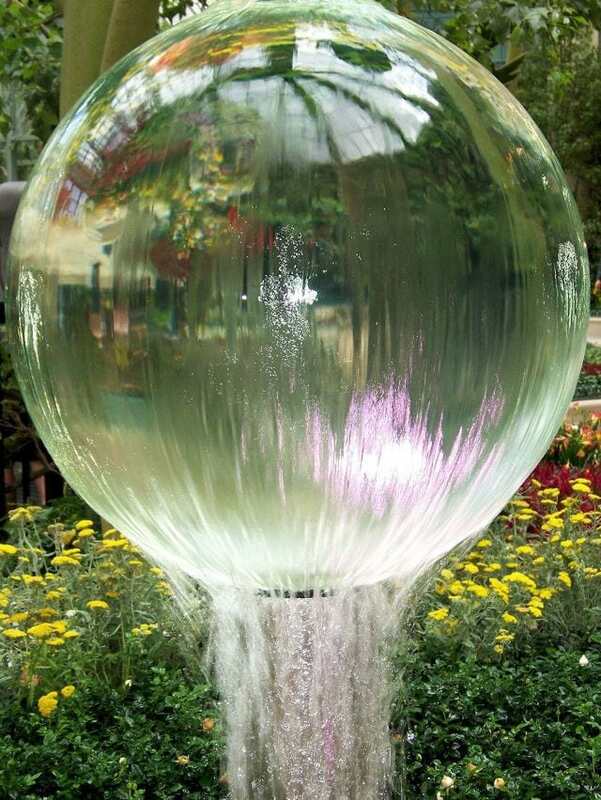 This giant glass ball looks as if it has raised from the depths of the pond. Glass and water marry well to showcase each as a unique part of any water feature. Simple spheres, such as this, or even square boxes look as if you could peer into the water from whence they came. 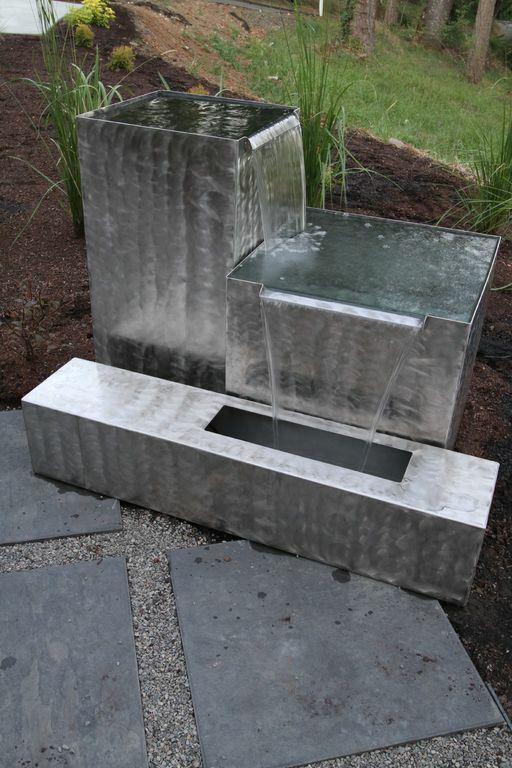 Get creative with some galvanized steel and make your own fun, boxy fountains for your garden. 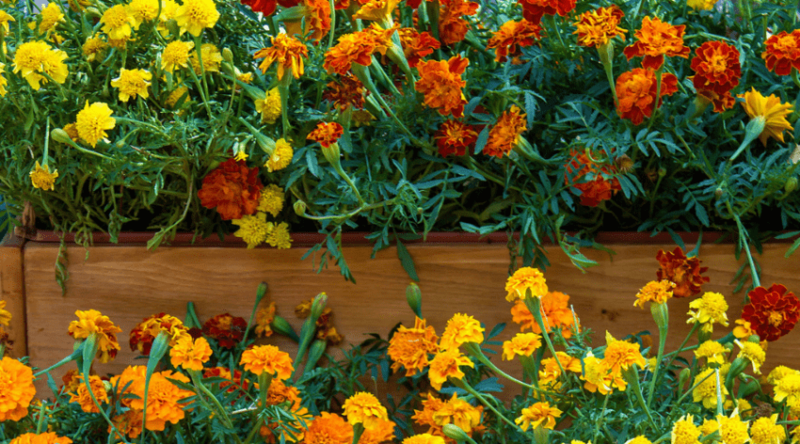 This is a neat way to add color and water to your yard for a feature nobody else will have. 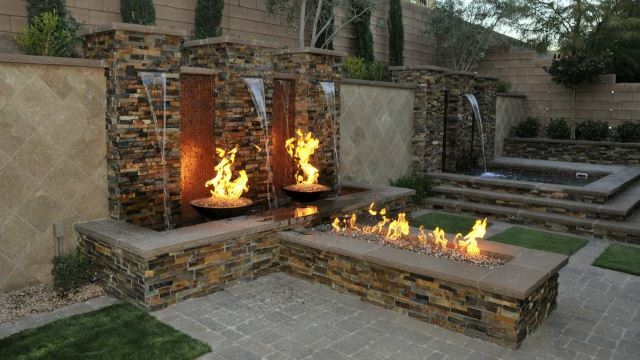 A raised fire pit provides the perfect place for your guest to kick back and relax around each evening to the gentle falls of a simple water wall. Water and fire go well together when combined in such a space, and evening lighting is also easily reflected for nighttime ambiance. No matter when you decide to add in a water feature, having one adds more than a few benefits to your landscape design. 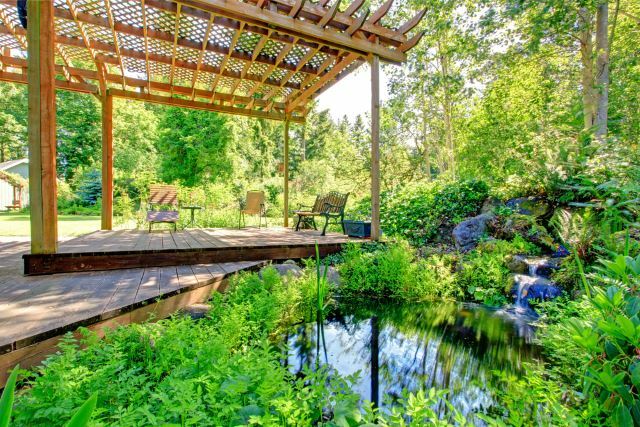 Butterflies and birds, as well as many pollinators are drawn to water sources, plus you personally will have the soothing sound of moving water to enjoy as well. Even if you have a small space, simple pumps and fountain effects are easy to incorporate into garden beds, patios, and even raised decks. Since I plan on coming up with a new waterscape feature for my garden I’m now seriously debating which idea is my favorite to incorporate! I’d love to hear your favorite ideas and which you would use in your own designs below. And as always, please share!